In 2018, mobile will surpass TV ad spending by more than $6 billion, according to our latest ad spending forecast by eMarketer. By 2020, the channel will represent 43% of total media ad spending in the US—a greater percentage than all traditional media combined. 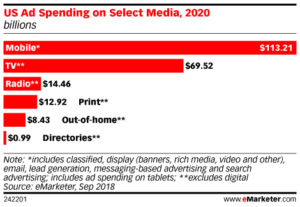 According to eMarketer’s estimates, mobile will account for $76.17 billion of US media ad spending in 2018. That’s more than TV ($69.87 billion)—and it’s significantly more than print ($18.74 billion), radio ($14.41 billion) and out-of-home ($8.08 billion). 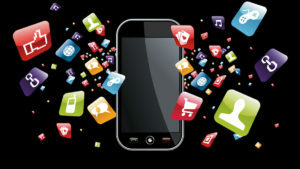 By the end of the forecasting period (2022), mobile ad spending is expected to more than double that of TV. The channel will make up $141.36 billion of US media ad spending, while TV will account for $68.13 billion.